From Quiet To Riot With The Flick Of A Switch To give the Chevelle the desired exhaust flow and sound, we gave it a full, cutout-equipped exhaust system. While the owner wanted to make the car street-friendly, he also wanted to maintain the high-flowing exhaust capabilities – which made the car a perfect candidate for an electric cutout setup. 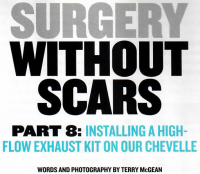 Article in Super Chevy June, 2012 Issue - "Exhaust System Upgrade - What A Drag, Part 5" ArticleAn improved exhaust system can radically improve your car's performance. Article in Muscle Mustangs & Fast Fords January, 2011 Issue - "Latemodel Restoration Supply Pypes Exhaust - Music To My Ears" ArticleWe Ditch The Dumps On Our '93 SSP In Lieu Of An Entire Pypes Exhaust System From Latemodel Restoration Supply. 12" Diesel Stacks Featured on Autoblog.com American ingenuity FTW! 12" Pypes stacks.